Tonight's Houston Rockets were bad. 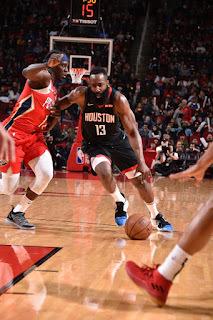 Maybe a different Rockets team can show up in future, but the team they are at this exact moment is, in fact, just as bad as the team that lost the first game of the season to the New Orleans Pelicans, and probably worse. This version of the Pelicans was missing Anthony Davis, who just demanded a trade, as well as four more of their top six players (Elfrid Payton, Nikola Mirotic, Julius Randle and E'twuan Moore, if you're curious). As abysmal as the first game of the season was, this was worse. James Harden got thirty points, I guess? The Rockets won the first quarter and then failed to win any more of them. Jahlil Okafor and Jrue Holiday were the best players on the floor with rookie Kenrich Williams a close third. For those of you wondering, he isn't on the Rockets. Don't watch this game. Don't watch this team. Do something else with your life until they get healthy or manage to care every night or whatever awful habit they've fallen into. Until they get to 10 games above .500, I don't believe in them, and I encourage everyone else to wait for this benchmark as well. It's a process. Tonight, the process was going the wrong way.